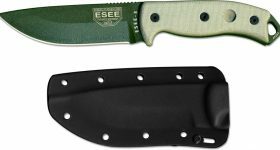 The Laser Strike Knife by ESEE can prove its worth under a myriad of circumstances, whether you like hiking, camping, or hunting. It is one of the most effective survival knives out there and it cuts through pretty much anything as if it were butter. Let’s look at some of the features that make this unit stand out from the crowd and that render it fully capable of withstanding the challenges thrown at it by the wilderness. One of its best qualities is its uncomplicated design. It’s simple and it consists of a one piece made out of steel and two handle scales. The knife measures ten inches on the whole and it is equipped with a 5-in blade. This is the ideal size if you want to make sure that you can carry your knife conveniently and comfortably, but the handle also gives you the power you need in most situations. The next attribute that might convince you to give it a go is its weight. It’s not exactly lightweight, and while for some, this aspect might be a disadvantage, we’ll argue that its weight is just what makes it reliable since you will have a good grip on it while handling it. The full tang design of this product is another thing to write home about. It’s basically made from a single ten-inch slab of steel. The outline of the handle matches the tang, and the product is outfitted with a reasonably sized finger choil. There are virtually no weak spots that can be discovered and there’s metal almost anywhere. The saber ground blade is flat and some hunters note that it is slightly thicker than other models they have tested in the past. Many of its competitors are equipped with thinner and lighter blades, which means that they do not feel as solid as this knife in the user’s hand. The extra weight renders this tool effective even for chopping purposes. In theory, that would be impossible with a product of this size, but if you decide to spend the night in the woods, you’ll definitely make use of it and chop some wood for a fire thanks to its tang, weight, and design. The cutting edge measures 4.5 inches and is extremely sharp. Since it is made of carbon steel, you will have to make a bit of effort in the way of ensuring it is properly maintained, but it does have an excellent advantage especially when compared to stainless steel. It retains its edge for a really long time. While the spear point can be used effectively for fine cutting, the flat and thick back surface makes it more than adequate for skinning purposes. Since the handle plays an important role in the whole user experience and is probably one of the essential features when it comes to safety, let’s see how this one performs. It’s made from canvas-laminated micarta, so there’s a woven surface texture that will give you a great grip even when it’s raining. The ergonomic design of the handle is another aspect to take into account, and the fact that it has a finger groove located behind the choil complete with a slight bolster at the pommel end renders it usable. For extra security, the manufacturer has added a lanyard hole bored through the scales and tank so that you can conveniently and easily secure your knife to the belt. On top of everything, the model is accompanied by a sheath that also makes it stand out. Why is that? Well, compared to many of its competitors, the sheath of this knife is made from Kydex, so that means that it will definitely stand the test of time. Furthermore, sheathing the blade results in locking it firmly so that it is virtually incapable of falling out on its own. However, that doesn’t mean that you’ll encounter any problem when drawing it out. Additionally, the sheath is equipped with a removable paddle complete with a high-quality belt clip made out of steel. You can mount the paddle on either side of the sheath by using the lashing holes with the supplied bolts. All in all, the ESEE ESLSP-BRK Laser Strike is a comfortable and solid knife that has an excellent cutting power. It is a handy tool for survival and hunting purposes, and you’ll have no trouble using it for skinning. It can even be utilized for starting fires, so it can get you out of a tricky situation.